So you have bought the best baby crib, baby crib mattress and even a diaper pail for your baby’s nursery. Think you have got everything ready? You have left out one very important item - the ﻿Humidifier﻿. We don’t blame you, many do not even know the essentiality of a baby humidifier in a nursery while others wonder if it really is necessary to get one. There are many viruses and bacterias that thrive in the air and while we, as adults, are stronger and better immune to repel these nasty stuffs that cause infection and illnesses, babies and young ﻿children ﻿are more susceptible to falling sick because of them. This is worse if you live in dry climates or during the winter months when humidity level low. So what should you do? A humidifier is your answer. In short, a humidifier evaporates cool mist that increases the humidity level of your surrounding air. This helps babies, and really everyone else, lessen cold and flu symptoms because congestion of the ﻿﻿nose﻿﻿, throat and lungs mainly stemmed from dry, itchy air. All things aside, it helps babies sleep better throughout the night because it prevents your baby from coughing or getting a dry and stuffy nose at night. The Honeywell HCM350W is much quieter than other evaporative humidifiers, in fact, it has 3 settings ﻿for ﻿you to adjust the sound level. At the lowest setting, we can say it is almost silent while it is not unbearable with the other two higher settings (read here to find out why noise is actually a good thing). 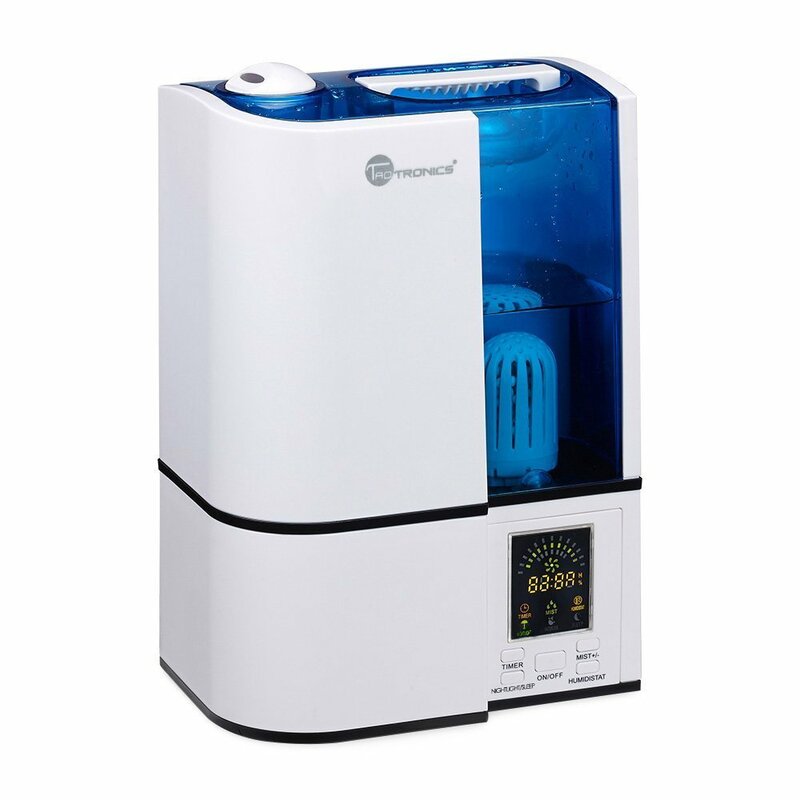 What we particularly love about this humidifier is that it has a patented germ-killing mechanism that kills mold, bacteria, fungus and virus by exposing untreated tap water to ultraviolet light ﻿when ﻿it first enters the water tank. Such sanitized water will then go through a ﻿﻿wicking﻿﻿ filter that remove any impurity. This will ensure that water emitted into the air as fine visible mist will not leave white dusts everywhere. You do have to replace this filter and Honeywell recommends every 1-3 months. Replacement is very easy, just drop it into its designated space and off you go – no hassle at all! 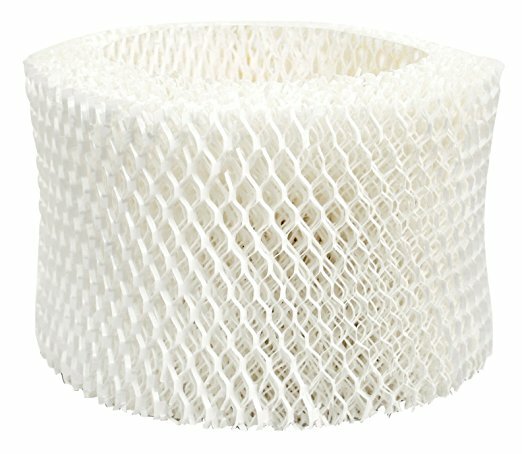 The price of a filter is relatively cheap (check out price here) and you can always buy in bulk to save more since ﻿you ﻿will go through at least 2 filters a winter anyway. 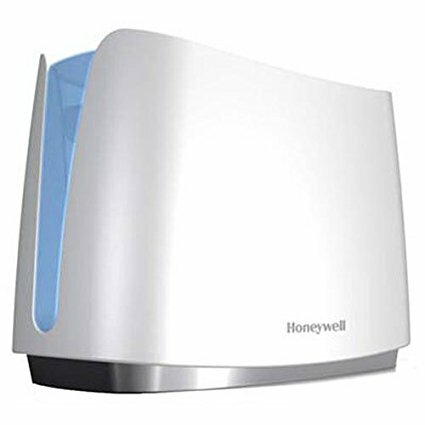 Another thing that we love about the Honeywell HCM350W is that it is the best easy to clean humidifier. It has a detachable water reservoir for you to do your refills or cleaning. This means you do not have to worry about water getting into ﻿the ﻿electronic parts at all. Also, the opening is pretty big (you can put your whole hand in to scrub along the edges) so you do not have to worry about water spilling everywhere and making a mess when you refill. Every part that comes into contact with water, that is, parts that you have to clean to prevent bacteria or mold from accumulating, can be fully submerged into water to ensure a thorough cleaning session. You even have the option of washing the reservoir and water tray in dishwasher! Regarding the question of mold which is a common occurrence in humidifiers, the Honeywell HCM350W does have this problem still but there is a way to getting around it. Just make sure you clean it regularly and let the filter dry out once in a while. You will not regret getting this as it is no doubt the best evaporative humidifier in the market! At around $15(!) only, the price point of this humidifier is unbeatable. Yes, we couldn’t believe our eyes too﻿﻿ ﻿﻿especially after finding out the many features this sleek, modern looking gadget hold. This improved version of the old model now produces more mist that can be adjusted in two settings – continuously or intermittently. ﻿﻿﻿﻿Either ﻿﻿﻿﻿way, the full capacity of 100ml will last you up to 6 hours of use. Once it runs out of water, it will automatically shut off to prevent the product from being burned out. 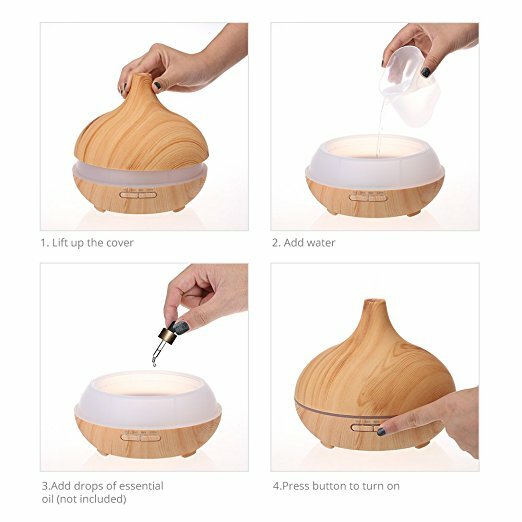 It also features an advanced ultrasonic vaporizing diffusion technology that quietly diffuses your favourite scented oils without heat so as to ensure their holistic properties stay intact. Keep in mind to only use 100% pure essential oils with no corrosivity to preserve the longevity of your humidifier. The 7-colour changing lights is a great feature to keep your nursery dimly lit which if you do not prefer, can be shut off or you can always choose its nightlight mode. You can also program the on/off cycles to your preference. 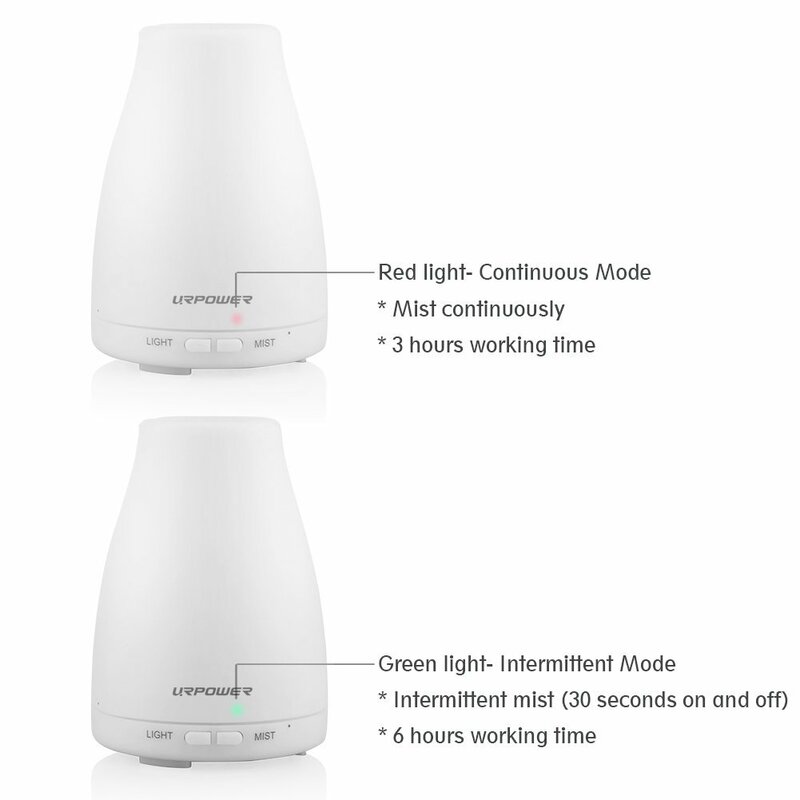 The only downside we can find of this humidifier is that despite increasing its capacity already, can only last 6 hours (and that is on intermittent use; if used continuously, it will shut off after 3 hours) when many other brands can easily accommodate up to 8 or 10 hours of use. Nonetheless, we do like that it does not require a filter and that you can use it as it is for as long as it functions. And because of its small size, it is the best portable humidifier for you to bring around. At such an affordable price, there really isn’t much to fault this best budget humidifier. We can say it is the best filterless humidifier so if you want something that is inexpensive and is low maintenance, look no further! At a quick glance, you may not be able to tell that the VicTsing Cool Mist Humidifier is in fact, a humidifier! 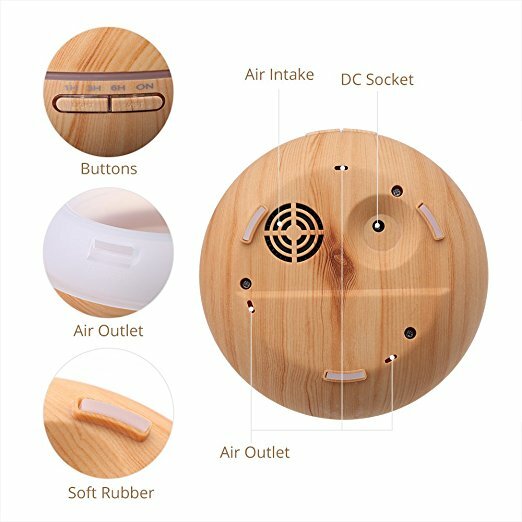 Bearing a unique and compact design that is coated with wood grain, the VicTsing Cool Mist Humidifier is also an ultrasonic aroma essential oil diffuser for home, office and even nursery. 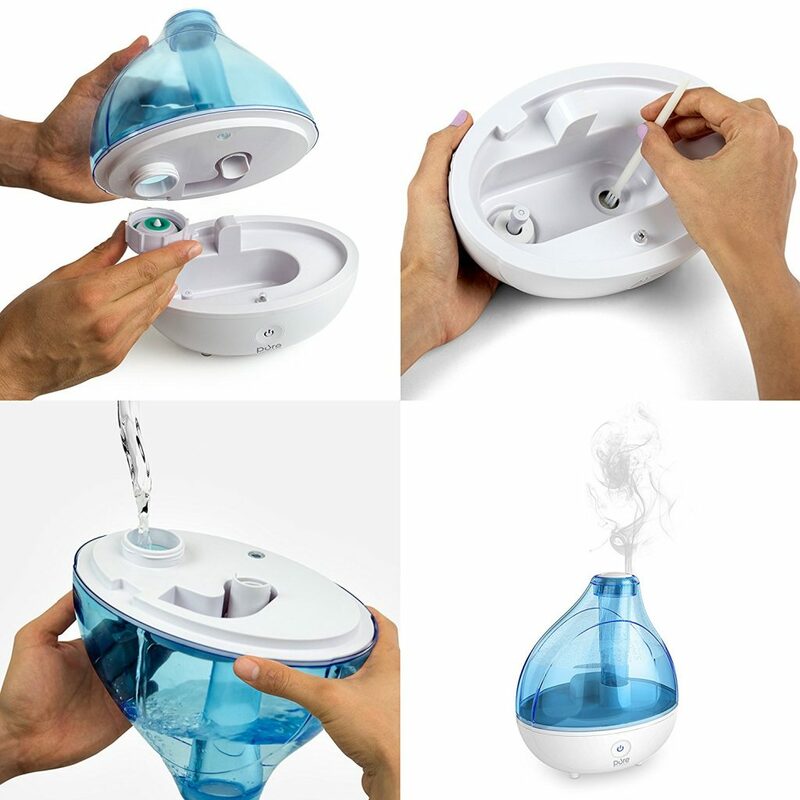 What we like about this humidifier (aside from its unique design) is that it is very compact and portable. The cap of this humidifier/diffuser can be easily taken off without having to unscrew with great force and this thoughtful design is appreciated because we know how troublesome unscrewing is especially when your hands are wet. It also has a large capacity of 300ml which means you get great mist output and it can run up to 10 hours of continuous use. We like that you can control the time in 4 settings - 1, 3 or 6 hours or continuous on. Once water is used up, it will automatically shut off to ensure safety. As with most ultrasonic humidifiers, you can be assured that the VicTsing is extremely quiet when working. 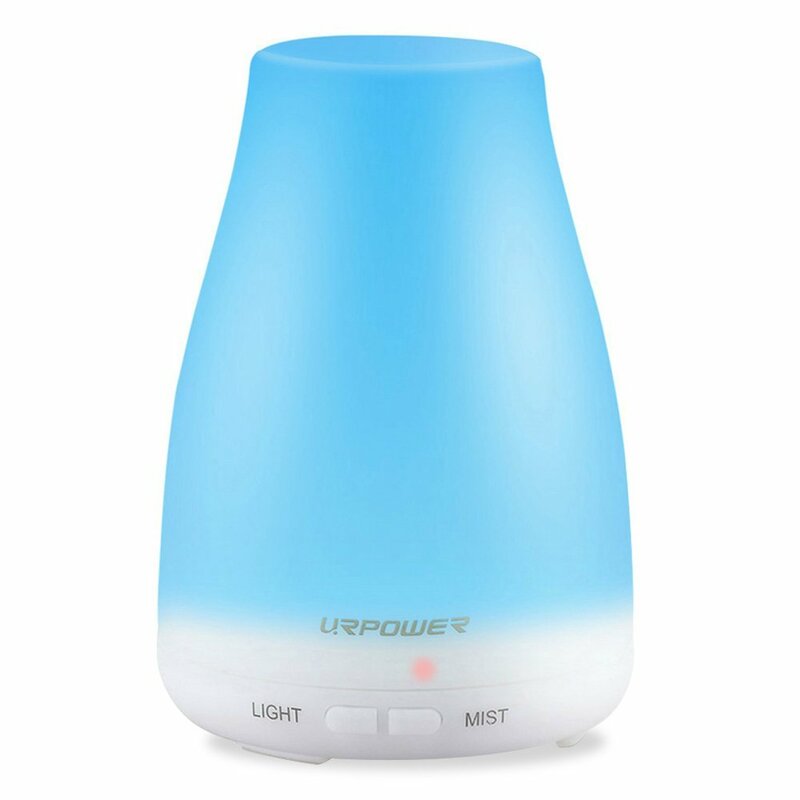 While buyers primarily use it for its essential oil diffuser function, if you have any concern of baby or young children inhaling scented air, you can always skip the step of adding essential oils into the water. Just fill the tank with purified water and use it as a humidifier! There are 7 colours to choose from and you can adjust the brightness to act as a nightlife for your little one. The only gripe we have with the VicTsing is that the water tank is not detachable. This means you have to be extra careful when cleaning it as you should avoid water getting into the electrical parts located at the bottom of this humidifier. The good thing is, the opening is very big for you to refill or pour out excessive water so as long as you do not submerge the whole thing into water, it should be relatively easy to maintain. Our tip is to use a cloth to wipe the water tank everyday by way of cleaning so that you do not have to worry about water getting into the mechanism parts. Do not keep water stored inside for more than a day without use. After pouring out excessive water from the tank, keep the tank open and let it air dry. This shall prevent any mold or nasty stuffs building up in your VicTsing﻿﻿ Cool Mist Humidifier. If you are looking for a large capacity humidifier that can last for more than 10 hours of continuous use, the TaoTronics Cool Mist Humidifie﻿﻿r will be the best humidifier for you. Its 1-gallon water capacity and 15 hour work time (on a full tank) is definitely its biggest selling points. If you live in a particularly dry climate country or have rough winter temperatures to endure, you may need to have your humidifier up and running for a long time to moisten the dry surrounding air. The TaoTronics will last most of the day and well into the night without having you constantly remembering of refilling every other hour. In fact, it is the best whole house humidifier because of its large capacity. We also like how it has a microporous ceramic cartridge that filters out micro-organisms and bad odor so that you get clean, purified water mist to humidify your room. You do not have to buy refills for this filter as the one that comes with it is permanent and user-cleanable. TaoTronics went a step ahead to include a humidity level feature so that you can set the best ideal range for your room. 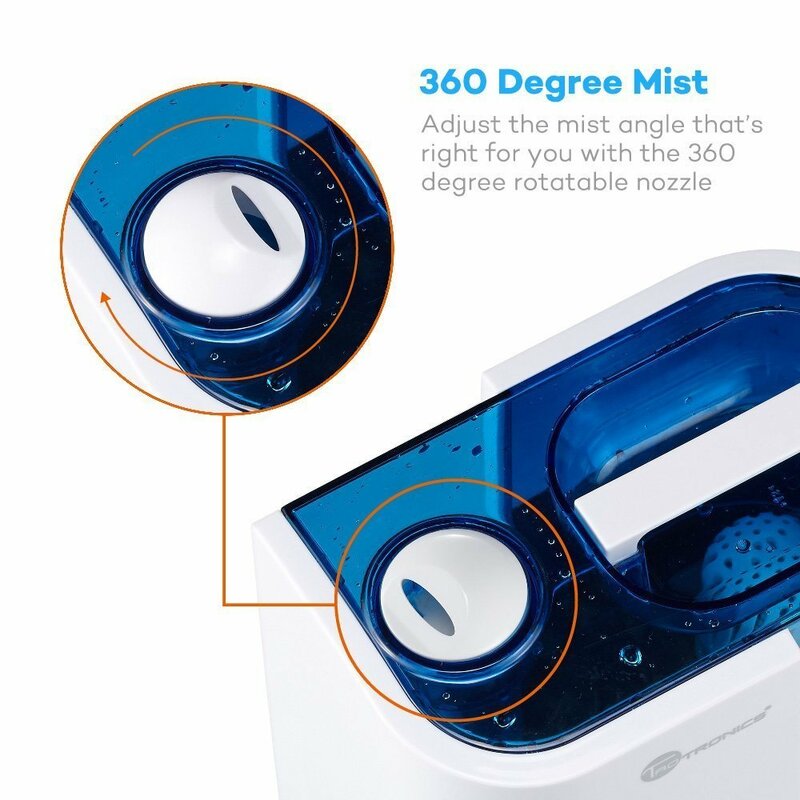 You can further control the mist modes in three available settings and use the 360 degree nozzle to adjust the mist angle that suits you. 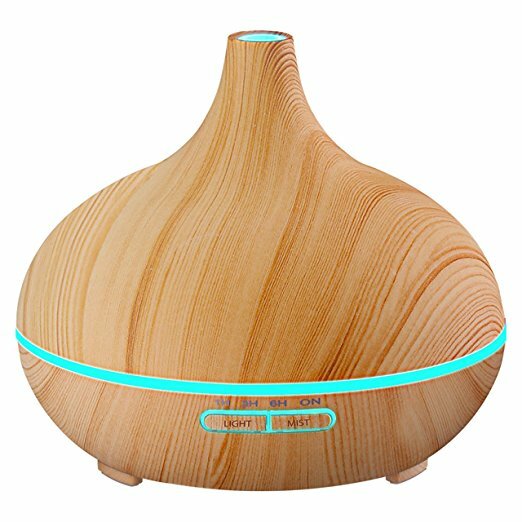 As an ultrasonic humidifier, the TaoTronics is incredibly quiet with only 38db of noise, which is an improvement from its previous model. 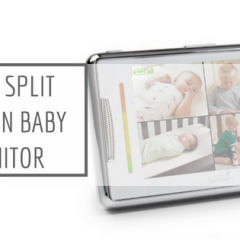 You can be sure that your baby’s sleep will not be disturbed from both the noise and LED light as it automatically switches off if you turn on the sleep mode, or you can always set a timer for how long you want it to run before it switches off itself. 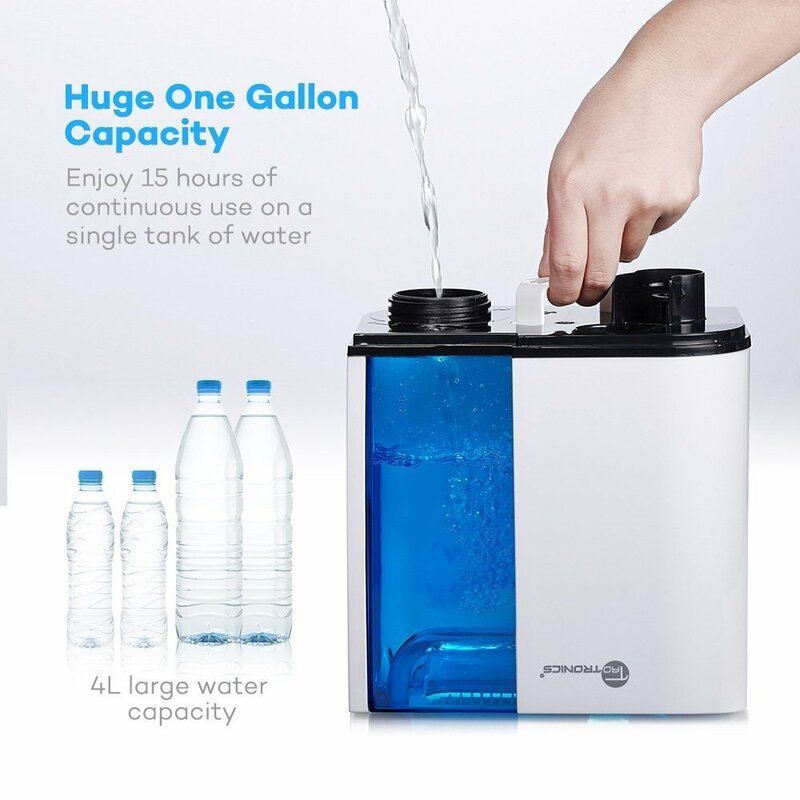 Cleaning and maintenance wise, the TaoTronics is relatively easy to refill water and the two handles on the top and bottom of the unit makes it convenient to carry when it’s full. While we like that the water tank is detachable from the unit so that you do not have to worry about water getting into the electrical parts, we wish that the opening of the water tank can be bigger so that you can clean and rub the inside of the tank freely with your hands. Also, the size of this humidifier is relatively bulky so it will require considerable counter space but this is unavoidable given its water capacity. As mentioned above, if you live in very dry countries and want a long-running and heavy duty humidifier, the TaoTronics Cool Mist Humidifier will be the best humidifier for you and your baby. If you think the TaoTronics Cool Mist Humidifier is a tad too large for your nursery’s counter space, you may consider getting the PURE Ultrasonic Cool Mist Humidifier which is also known for its large capacity and long working time. This humidifier has a 1.5 liter tank which enables it to run continuously up to 16 hours on low setting. While you get only half the capacity compare to the TaoTronics, you also get a much smaller and compact sized humidifier that will not take up too much space and is more portable. The downside of the PURE Ultrasonic Cool Mist Humidifier is that its water tank has a relatively small opening (even smaller than TaoTronics’). There will be no problem pouring out or replenishing water into the tank but its inside is certainly not the easiest to clean as you cannot fit your hand into it. You may overcome this by using a brush to reach the inside of the tank to scrub along its sides. Another downside is that its LED light cannot be switched off so this may be a disturbance for those who need to sleep in complete darkness. This may not be that big a problem if you use it solely for your nursery as the light works well as a nightlight to reassure and soothe babies and young children. 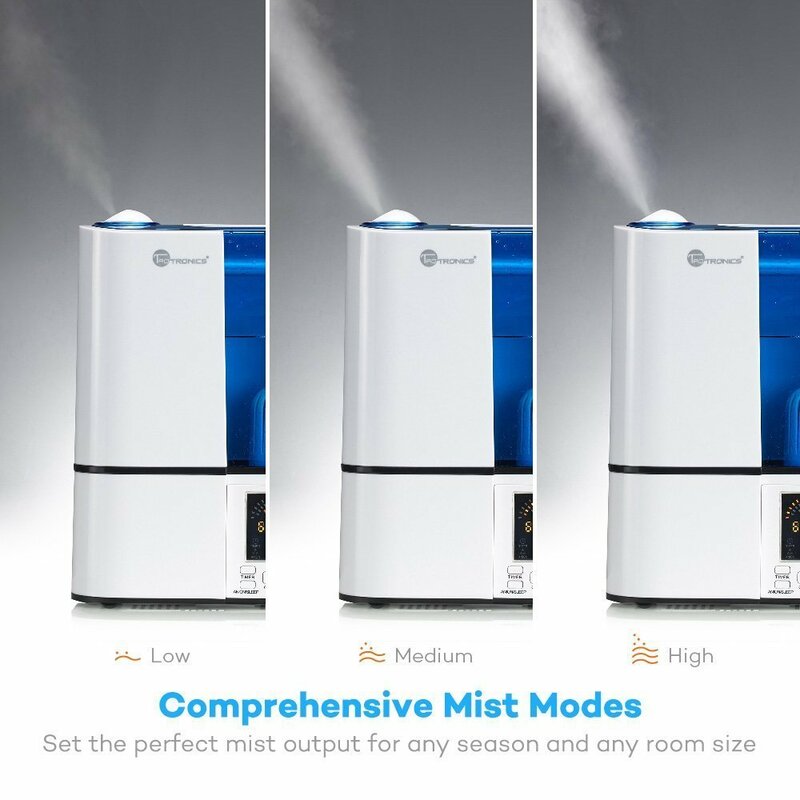 Overall, the PURE Ultrasonic Cool Mist Humidifier is one of the best seller humidifiers in the market and with a 2-year warranty backed by Pure Enrichment, you can be sure you are in good hands. 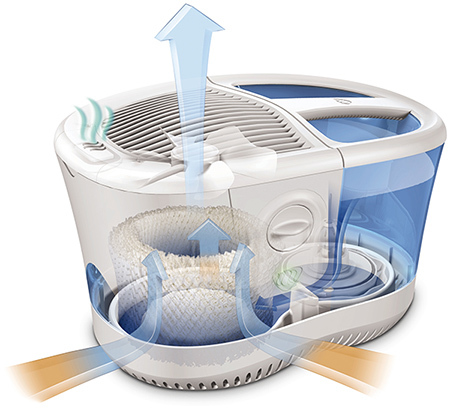 This type of humidifier relies on fans to blow air through their wick filters and this is the most common type of humidifiers. If you purchase a console ﻿humidifier﻿, chances are it is most likely an evaporative humidifiers. 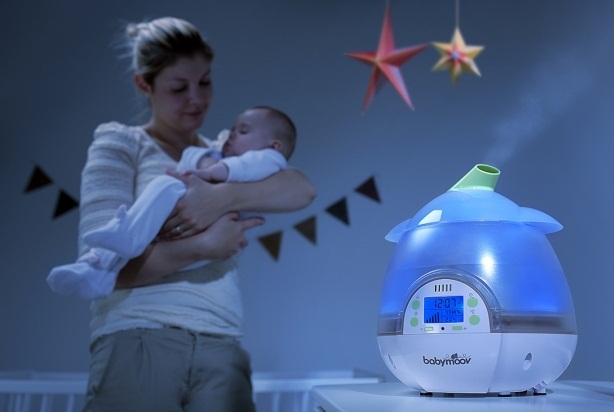 It uses the most natural form of evaporation and in our opinion, is the best humidifiers for babies. uses the most electricity as it employs a heating element to generate steam. Due to this heating element, we do not recommend this type of humidifier anywhere near a baby or children as it presents a certain degree of burning hazard. forced out by a tiny fan but there are some ultra mini models that have no fan, the latter mainly meant to be of personal use. While it is the quietest type out of all as it has no fan, ultrasonic humidifiers are known to leave white dusts on all surfaces due to the minerals from the water. Always go for ﻿an﻿ evaporative humidifier. When you think about it, the reason of getting a humidifier is to add moisture to the air. While the quietness of the ultrasonic humidifier is an attractive element, the fact that most models will leave white dusts everywhere is a real concern. If you wish to get one still, make sure that it comes with mineral cartridges to filter out the debris. Besides, studies have found that babies tend to sleep better when the room is not in complete silence so the soft humming sound (“white noise”) that comes from evaporative humidifiers can be rather soothing for babies to get a good night’s sleep instead . Be it evaporative or ultrasonic, stay away from warm-mist humidifiers as this type of humidifiers has a heating element ﻿which﻿ expose babies or young children to the risk of burning themselves. And because of its heating element, warm-mist humidifiers are generally more expensive to run as it uses more electric down the road. 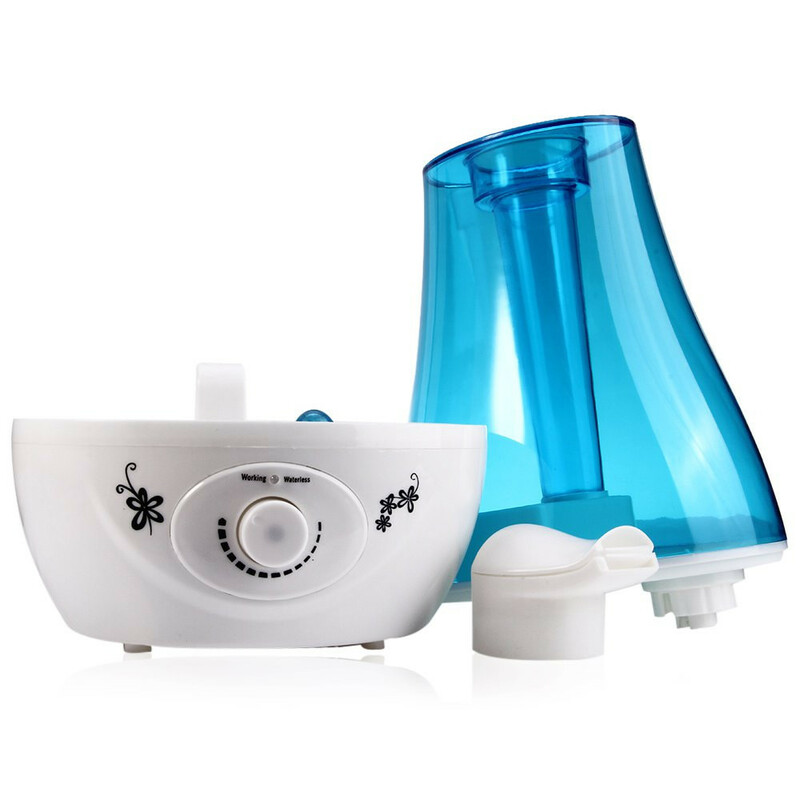 Level of ﻿﻿noise﻿﻿﻿﻿﻿ - You certainly want a humidifier that is near silent to avoid any disturbance to your baby’s sleep﻿﻿.﻿﻿ Most ﻿ultrasonic humidifiers﻿ are near silent while many evaporative humidifiers like ﻿﻿this﻿﻿ ﻿have﻿ also achieve optimum noise reduction nowadays. Ease﻿﻿﻿ ﻿﻿of cleaning - You want to find a humidifier that is easy to clean because regular cleaning will be required to keep mold and mildew away. Those that have a detachable water tank and big opening are most recommended. Working time - If you live in drier climate, it is recommended that you keep your ﻿humidifier﻿ on in your baby’s nursery throughout the night and you will need one that can run continuously for at least 8-10 hours. Auto﻿﻿ shut-off﻿﻿﻿ - Having this will ensure your humidifier not burning out when it runs out of water. This will preserve the humidifier’s performance in the long run to get the best of your money’s worth. Humidistat - This is not a must and not every humidifier has this feature but an inbuilt ﻿humidistat﻿ will adjust the humidity level of your room to an ideal range so that it will not be too high (cause mildrew) or too low (dry skin, wrinkles and higher chance of cold). 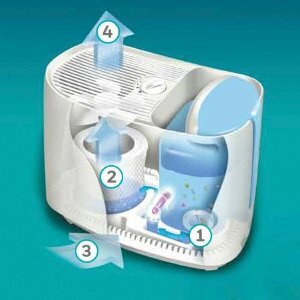 Antibacterial ﻿﻿features - This is a bonus if your humidifier comes with this feature as it filters out micro-organisms and bad odor from the water first before emitting it out as fine mist. Humidifier like﻿ ﻿this also kills off germs with its UV rays to give you that extra assurance of clean, purified humidity. 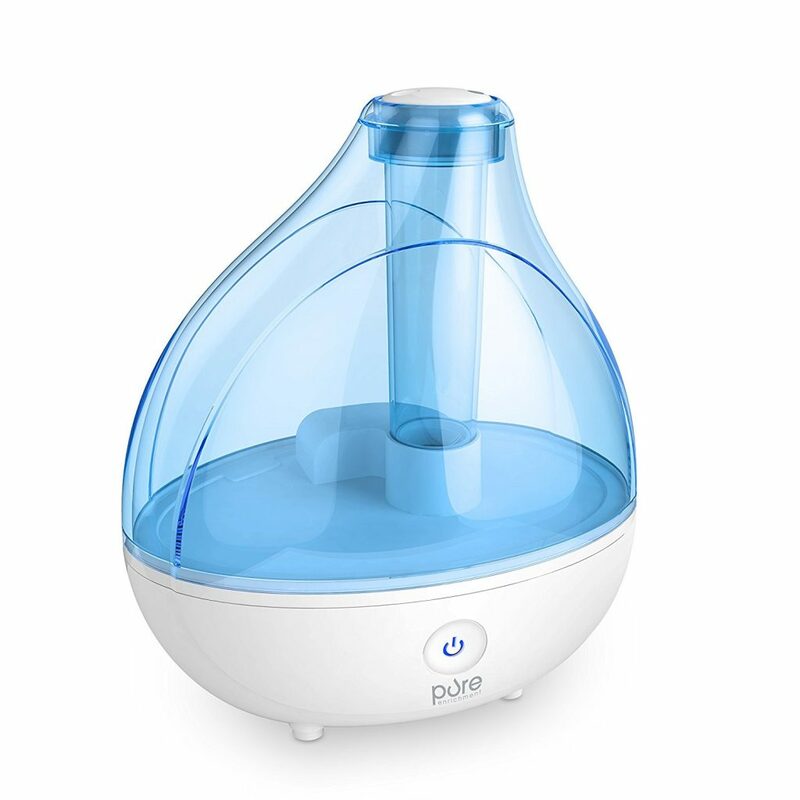 Price - This should be the least concerning factor as most humidifiers are around the same price point (﻿around﻿ $50), although there IS some at an unbelievably cheap price like this. B. What is better - Humidifier or Vaporizer? 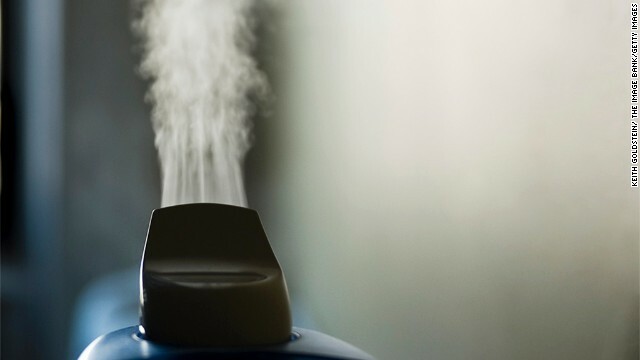 ​While both humidifier and vaporizer make it less drying to your mouth, throat and nose, the mist from a ﻿humidifier﻿ is generally more comfortable to breathe than hot steam. This is especially so for babies. Besides, the vaporizer’s hot water and steam can burn young children if they put their face too close in the steam or tip the container onto themselves and this can be a serious safety hazard. Keep in mind though, mold and bacteria can grow in the water of cool-mist humidifiers and this will be ﻿unhealthy﻿ to breathe in. It is therefore very important that you follow the manufacturer’s instructions to empty the water and clean the container with soap and water regularly so that you can enjoy the most out of your humidifier. 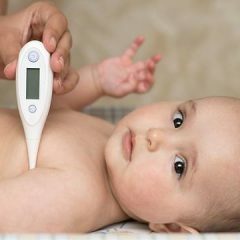 ​Keep flu and cold away - Added moisture from a humidifier helps ease cold and respiratory illness symptoms which babies and young children are more susceptible to. It helps loosen up and drain congested mucus in the nose, decreases swelling in the nasal passages and opens up the airway for breathing. Steam does not actually attack the viruses causing the cold, which is another reason why we recommend a humidifier over a vaporizer. P﻿﻿revent d﻿﻿ry skin - Baby’s skin is sensitive to dry climates and can result in red patches and tender, chapped lips (worse, it aggravates common skin conditions such as eczema) so having a humidifier to moisten the surrounding air can relieve your baby from irritated, dry skin. White noise - The soft humming sound coming from a humidifier may be noisy and annoying to you, but such ‘noise’ - also known as ‘white noise’ - is actually soothing to a baby which helps them sleep longer ﻿and﻿ more comfortably throughout the night. Prevent asthma - Cold, dry air (think winter time) is one of the common triggers to asthma. With a humidifier, you can control the level of humidity of your indoor air which in turn prevent the development of asthma in younger children. ​Note that this is a way of prevention of asthma only. If in the unfortunate case where your child is already suffering from asthma, extra moisture in the air may worsen his/her asthma symptoms. This is because moisture in the air can promote growth of mold in carpets and other surfaces, and ﻿such﻿ mold is a worsening catalyst to asthma. Please consult with a doctor first and discuss if a humidifier will be helpful or not in such situation. So you have bought the best baby crib, baby crib mattress and even a diaper pail for your baby’s nursery. Think you have got everything ready? You have left out one very important item - the ﻿Humidifier﻿. Compare and find the best humidifiers deals this Black Friday and Cyber Monday Sale!